The Darley Park Concert event went with out a hitch. Before I go any further I would like to make a few acknowledgements to those members who turned up to lend their support and assistance. First off, Mike Dumelow. 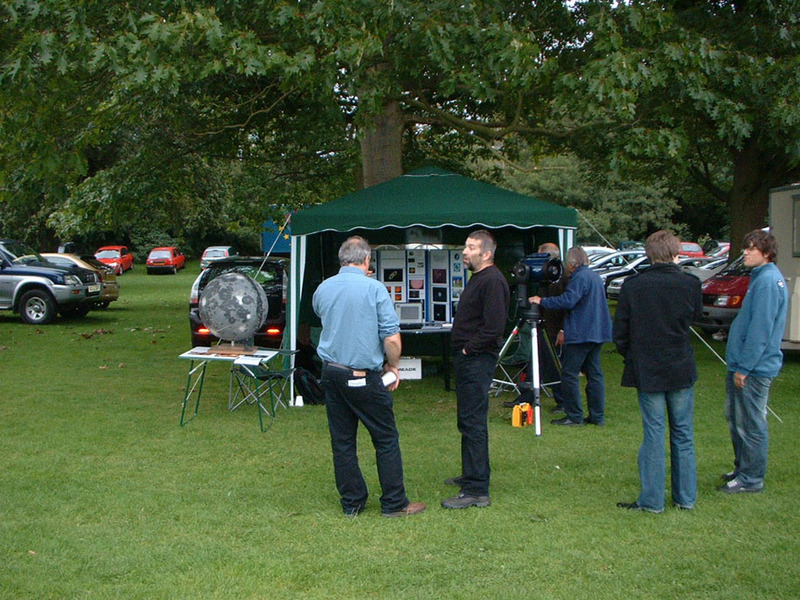 Mike brought the Society LX-90 to the event, as well as the Society Moon globe. Mike also assisted me in erecting the Society's gazebo and helped to set out display up within the gazebo, and spoke to people who visited our display. Next, thanks go to Tony Hubbard. Tony was a great help during the event, he helped with the setting up of the Society display, operated the LX-90, and helped speak to members of the public who came up to our stall during the evening. Finally, thanks must go to Claire Spencer, who turned up to offer her support and assistance. So there were four of us present on the night, the exact number I was hoping to have. We were given a small 'patch' of ground, under what appeared to be an oak tree, to the left of the concert stage area. We were situated between the refreshment and burger vans, so nobody could fail to notice us, as they went to get a drink, or something to eat! I thought that arrangement was quite cunning really! I arrived on site at around 2:45pm, we were asked by the organisers if we could arrived at 2:00pm to set up! I thought that was far too early, as the concert did not start until 7:00pm. So, I suggested to the organisers that we should arrive at Darley Park at around 3pm. I was the first to arrive, at 2:45pm. I brought with me, in my little car, the gazebo and all its framework, the display table, the Society display board, the Society laptop, so we could show a PowerPoint presentation. Mike Dumelow arrived a little after 3pm with the LX-90 and the Moon globe, and after a brief discussion as to how we were going to about erecting the gazebo, we got to work. Erecting the gazebo with two people is an interesting, if not, frustrating exercise! It was only the second time that I had set the gazebo up. We had the framework up and were preparing to place the 'roof' of the gazebo in place, that's when the 'fun' really began. Each time myself and Mike tried to put the 'roof' into position, the upper cross members kept coming apart, and not the same one either! It was starting to get a little silly, just when we had on area fixed, another crossmember would come apart somewhere else on the frame! But, a group of kind gentlemen came to our rescue helped us get the gazebo roof on and get it secured. They were only 'in the area' because they were heading for one of the refreshment vans to get a cuppa! 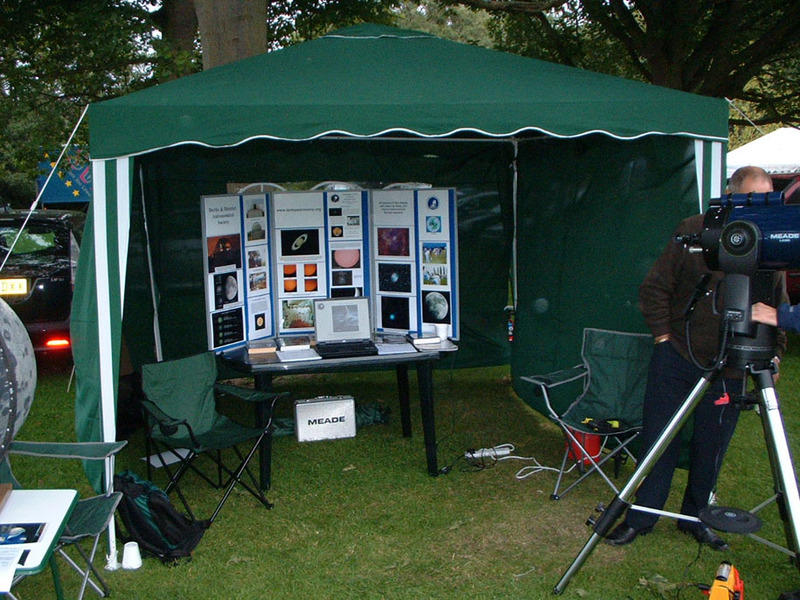 Shortly after that, Tony Hubbard arrived and we got the rest of the gazebo sorted out and got the display together. Whilst we were doing that, the orchestra was going through it'd final tune-ups and rehearsals for the concert later on, so we had music as we worked to set our display up. I had spoken to the organisers and arranged with them to provide us with a generator, so we could run the Society laptop during the event. A surge protected plug was purchased by the Society prior to this and was used to protect the laptop from any power surges from the generator. But I needn't have worried, as everything worked like clockwork. As for the event itself, it was fantastic. In my opinion it was the best event we have attended this year. As soon as we got the gazebo up and the display in place, people started to come up to us and talk to us, this was from about 4pm onwards. It never stopped, almost up to the end of the concert, but by that time, most people's attention was focused on the firework display! The members of the public who came to talk to use seemed to be very interested as to who we were and what we do. There seemed to be a genuine interest shown by all who stopped by to a chat. The Moon globe proved itself, yet again to be quite a 'crowd-puller', it proved to be a very popular aspect of our display. We did not get very many people of the 'we did not go to the Moon' persuasion. Although I did take a group of young lads to task when they said, rather sarcastically I thought, that Apollo 11 never landed on the Moon, and that the whole Apollo programme was faked. At that point I went onto 'Red Alert's status, and said to these youngsters, "Faked eh? Follow me, I have something to show you". I directed them to my PowerPoint presentation and I stopped the slideshow and found a section of the presentation that I had only added the previous evening. I pointed to the laptop and said "Right! Here's the proof we landed on the Moon"! I had been online and got the Lunar Reconnaissance Orbiter photographs of the Apollo landing sites, and incorporated them into the presentation, just in case we encountered any 'Moon Hoax' people. I showed these images to the Society at the beginning of the June meeting. At that time the Apollo 12 landing had not been imaged. But that site had been imaged by LRO this month, and it was a stunning image. I showed these images to the young lads I was 'talking' to and as soon as they saw the descent stages on the lunar surface, casting shadows, and in the case of the Apollo 12 and 14 landing sites, you can actually see the tracks of the astronauts footprints, they suddenly changed their minds! Perhaps men did go to the Moon 40-odd years ago after all! In the main, I felt that it was a grand idea to become involved with this year's Darley Park Concert, it would have been silly for us not to, being that this year has been the International Year of Astronomy and the 40th Anniversary of Apollo 11. I think that the Society has, once again, raised its profile with the wider community and people are starting to know who we are and what we are about, which is what the Society should be doing. Not only is the DDAS for us, it is for everyone, we should never forget that. We should go out and share our passion for the wider universe with everyone, because the universe is everyone's common heritage. I feel very proud of what we have accomplished this year. Summer 2009 has been the busiest year in the recent history of the Society. We have attended four events, starting in June with the QUAD Well Dressing, then the Aston on Trent well dressing, the display we had at the Barton Gate Steam Rally, and finally, the Darley Park Concert, which to my mind, was the most successful of all four events. Let's hope we have raised the public awareness of the universe and what astronomy and space science is all about, and it hasn't hurt that the DDAS has raised its profile too! You never know, we may have got a few new members out this exercise! I feel very proud of what we have accomplished this year and I am very proud to be the DDAS Chairman.